I will be the first to admit that the nice weather this last weekend got the best of me and I did not spend as much time in the bathroom as I would have liked. But that doesn't mean that progress wasn't being made. On Sunday we did some shopping for the bathroom, decisions were being made! We hit about 4 different home improvement stores checking out the bathroom vanity and counter top options. Don't be fooled if you think this was the first time we were doing this, remember I have been dreaming of this bathroom renovation for about a year. It's not that what we had was in bad shape, in fact I had replaced the vanity and counter top during my phase 1 update about 4 years ago, I just wasn't in love with it. My original plan was to reuse the vanity we had along with a new top. I wanted to hit all the stores one more time to make sure there wasn't a great deal for a vanity set that fit the space, I was weighing my time/cost options. Well I didn't find any that fit the bill, so the decision has been made. I am going to re use our old vanity, but it will be getting a new paint color along with a new top. 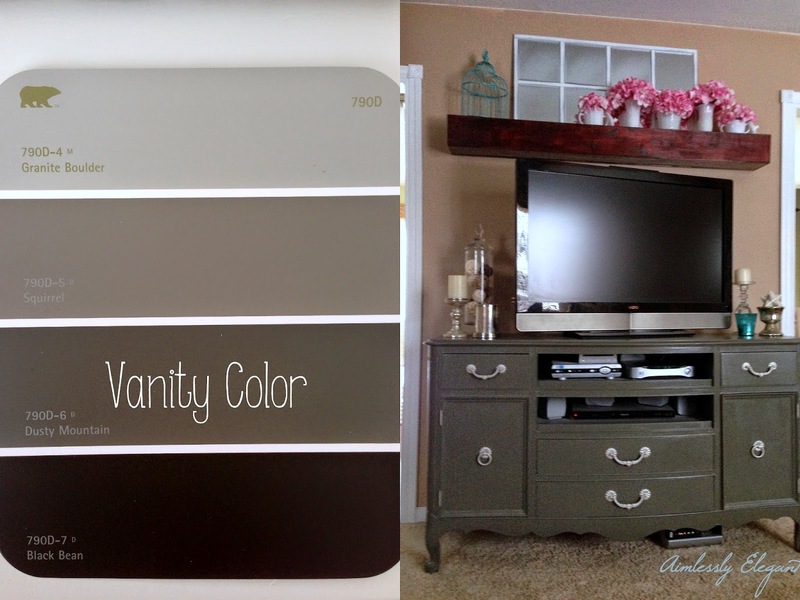 I am going to be using the same color I used on our TV stand in the living room, Behr's Dusty Mountain. 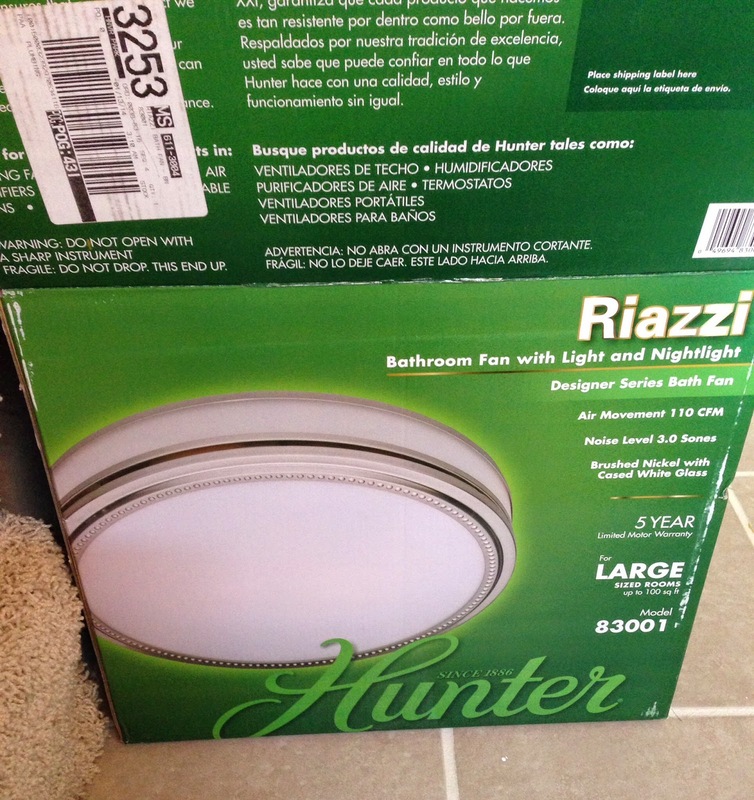 While out on Sunday we also picked up a new bathroom fan/light combo, can't wait for this to go in. Seriously who would have ever thought I would be excited about a bathroom fan?! 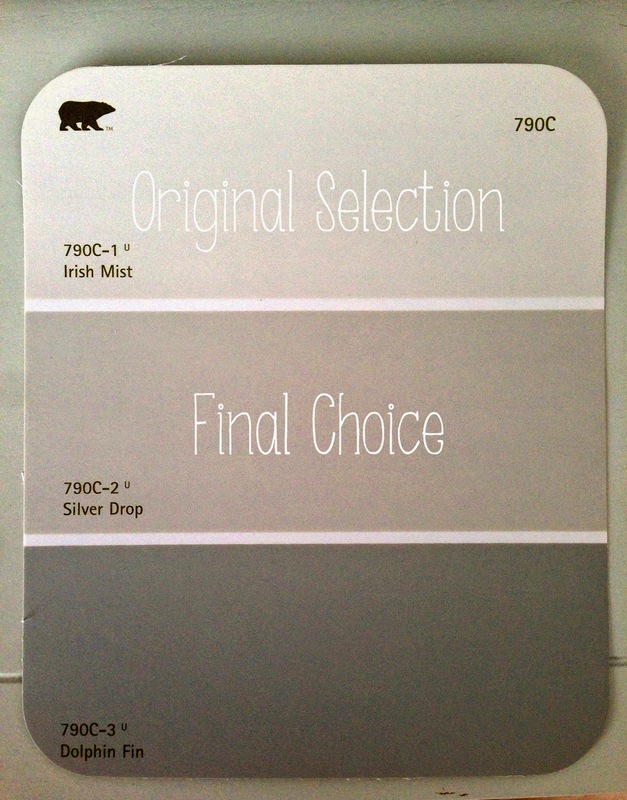 We also got the paint for the room, and ended up with a slight change of plans. Originally I was going to use the same color I had in the office, but decided to go one swatch down on the paint card for a little more impact. 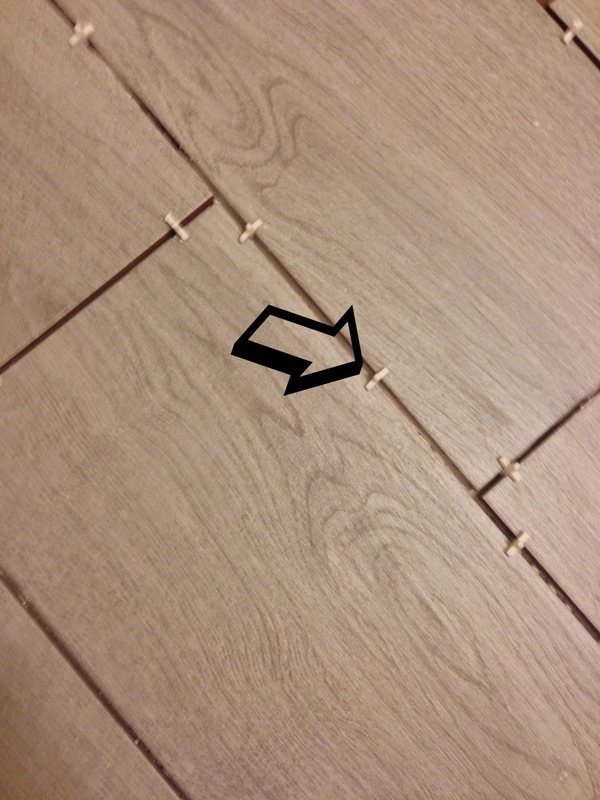 On Monday I spent way too long picking these little tile spacers out from the floor and shower walls. My hands were raw! There are still a few stubborn ones I have to go back with pliers to remove. This was one of those things were I thought "Oh this won't take long", I should know better by know to never think that. I took down the old bathroom fan, and the light since they are both getting an upgrade. I also got the room all wiped down and prepped for paint, yay! It may not look like much, but it's something! 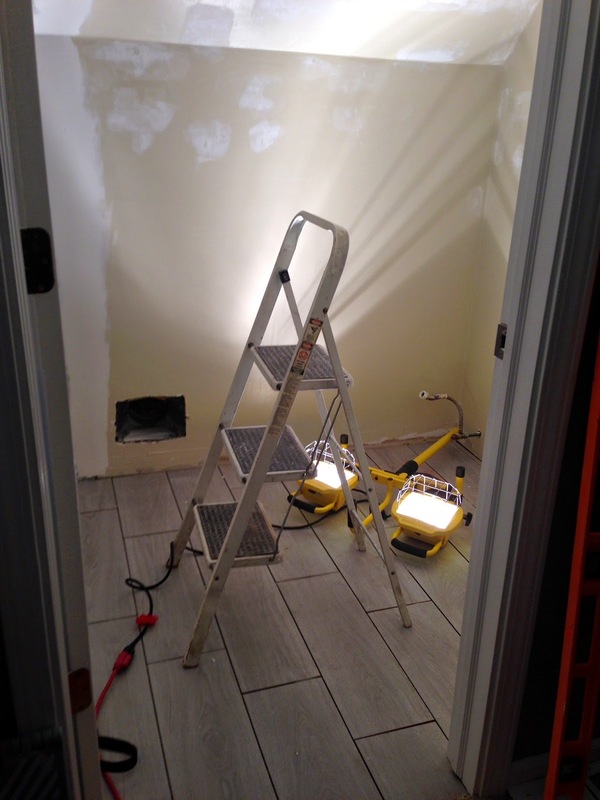 I will be back tomorrow with our easy lighting upgrade, Happy Tuesday! It's getting closer! Progress is progress, big or small! I love your living room decor! So pretty! It's looking great! I love the paint colors that you chose. Thanks, I am obsessed with that paint chip from Behr, I have used every color of it somewhere in my house - a lucky grab many years ago!